Cardiff City will hand out free red scarves to every fan at the visit of Brighton & Hove Albion on Tuesday. The Bluebirds controversially changed from their traditional blue kit to a red strip for this season. Malaysian backer Tan Sri Vincent Tan has paid for the scarves which will be given out before kick-off at the Cardiff City Stadium. 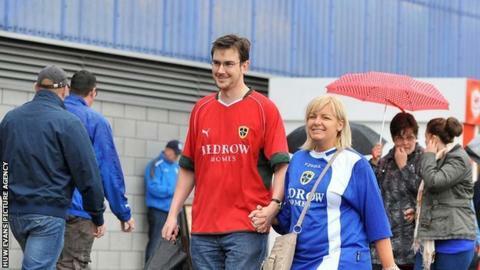 "It's a gift and a thanks for people backing his team," said Cardiff City manager, Malky Mackay. The Bluebirds are currently the Championship league leaders by eight points with a game in hand, and boss Mackay has backed the club's move to hand out the scarves. "Vincent Tan, our owner, wants to give everyone a scarf as a thank you and appreciation of people's commitment this season and who have backed the team," said Mackay. "He was there again on Saturday and he will be there on Tuesday night and he wants to give a scarf so people can cheer the team." Cardiff City unveiled controversial plans to rebrand the club in June, including changing the kit from blue to red and introducing a new badge. The changes were part of a "major and significant" investment pledge from Cardiff's Malaysian owners but the decision divided supporters of the Bluebirds. Cardiff's investors Tan Sri Vincent Tan and Dato Chan Tien Ghee believed the change of colour would expand the club's appeal in "international markets". As well as wearing red rather than blue home shirts - for the first time since 1910 - the Championship club say they will now look into expanding Cardiff City Stadium and upgrading the club's training facilities. The club's Malaysian owners have pledged £100m investment for squad strengthening, debt repayment and upgrading facilities to get the side to the Premier League. The scarf promotion, which will only take place ahead of the visit of the Seagulls, will also see supporters given the chance to win a season ticket for the 2013-14 season. The promotion will run for Cardiff's remaining eight home games at the Cardiff City Stadium, with any fan wearing a red scarf during those games having a chance to win the season ticket. Cardiff beat Bristol City 2-1 at the same venue on Saturday to keep their promotion push for the Premier League on track.